The weather gods smiled upon me once again this month, with dry skies and temperatures into the 50’s on my day off. I took Uncle Rico (my knickname for my Xtracycle-equipped bike) down to Kent to check out Wild Earth Outfitters, the new outdoor store. The most direct route to Kent is about 18 miles. I decided to try a new way to avoid some of the more heavily-traveled roads. I started by heading to Aurora and jumping on Pioneer Trail, a common launching point for many of my favorite routes. 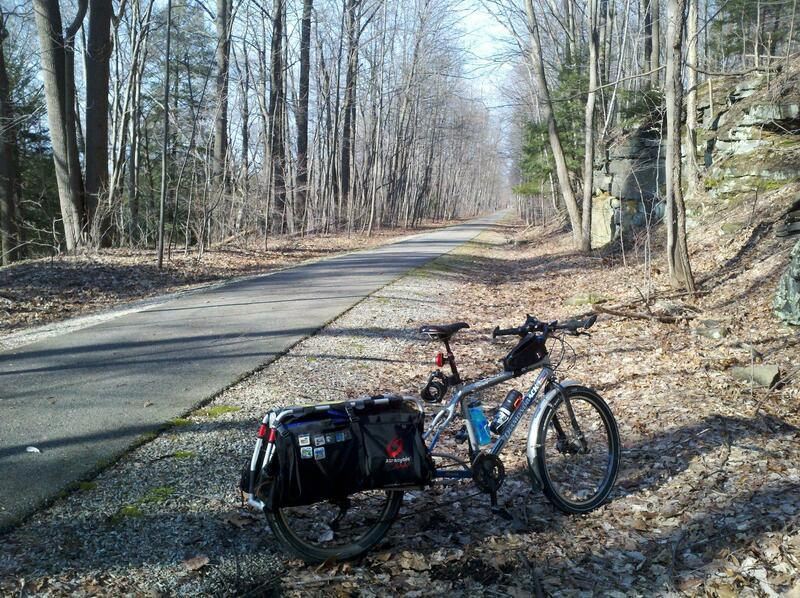 A good ways into Portage County (more eastward than I had anticipated), I made a right onto Diagonal Road. This road heads south and slightly west towards Kent, and runs concurrently on State Route 303 for about 1/2 mile in Streetsboro. I was starting to regret taking the scenic route, as I just wasn’t “feeling it” today; my leg muscles felt like they were running out of gas early in the ride. I reached the point just north of Kent where Diagonal Road becomes a one-way (the wrong way for where I was headed). To avoid having to hop on State Route 43, I made a left onto Ravenna Road, then after a couple of miles, a right onto Lake Rockwell Road, and shortly thereafter, hopped on the Portage Hike and Bike Trail for the final push into Kent. I finally arrived in Kent, after covering about 27 miles since I left home. I headed back out of town on Fairchild Avenue, and caught the Summit County Bike and Hike Trail where it starts near Stow-Munroe Falls High School. I followed it to where it meets Barlow Road outside of Hudson, then took Barlow Road west to go browse a bit at Appalachian Outfitters in Peninsula. 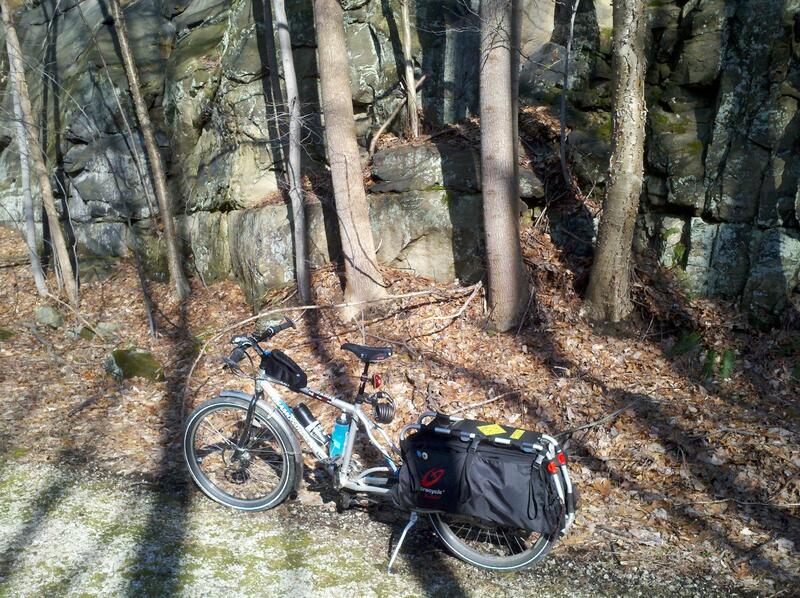 After that, I backtracked to the Bike and Hike and headed north. This is one of the most beautiful sections of this trail, where the former railroad bed cuts through a hillside, creating a rocky canyon wall, with sunlight streaming through the tree branches. I got to check out the latest developments on the Brandywine Road bypass. All of the trail is now done except for the new bridge over Interstate 271. Continuing north, when the trail dead-ends just before the future bridge location, you only have to hop on Brandywine Road for about 100 yards, and then make a left into the newly-refurbished parking area for Brandywine Falls. Then, hop on the new trail, loop around back under the parking lot entrance using the new tunnel, and continue on the new trail, around the Brandywine Inn, up the hill along Brandywine Road, then continue on the original trail. At this point I would usually continue north on the trail until it ends at the Summit/Cuyahoga County line, and follow Alexander Road back towards home. However, I had always wondered what it would be like to follow State Route 82 on the busiest part through the strip mall stretches in Northfield and Macedonia. So, when I got to where the trail crosses Boyden Road, I just made a right onto Boyden, headed up to Route 82, and made a right to head east. Route 82 wasn’t so bad after all. The only recommendation I’d make is to take your place in the line of cars well enough ahead of time before you get to a traffic light. Otherwise, the shoulder often disappears right before and after the light, so if you don’t take the lane, you’ll get squeezed out. Just east of where Interstate 271 cross Route 82, a bike lane starts and runs right along Route 82. The only dicey part was just before the Macedonia/Twinsburg border, when all at the same time, the road narrows from two lanes to one in each direction, the bike lane ends, and the road shoulder turns to soft dirt. The road opens back up to two lanes in each direction again soon after, leaving plenty of room to share the road heading towards downtown Twinsburg. Before heading home, I made a sightseeing side trip into the Locust Grove Cemetery, Twinsburg’s first burial ground, and the final resting place of many local historical figures, including Aaron and Moses Wilcox, the twin brothers for whom the city was named. I arrived at home with a total of 56 miles under my belt for the day. A very cool ride report Kevin, I’m glad you had the day off. Long trip, Kevin – but I’m sure you had a good time. I think it’s funny that you name your bikes, too!